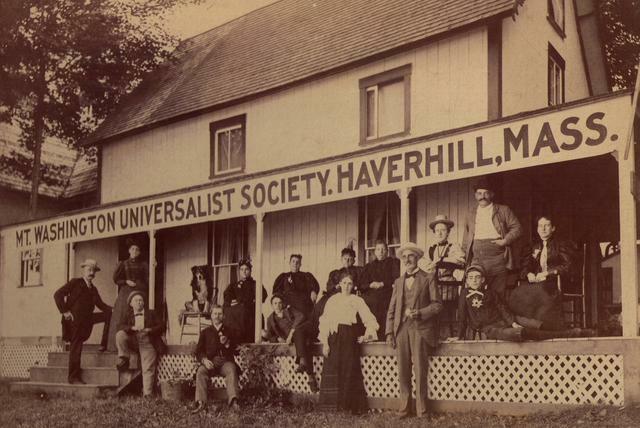 In 1950, two of Haverhill’s historic churches joined together to form the Universalist Unitarian Church of Haverhill. The First Parish was founded in 1645, and the First Universalist Church began in 1825. Our church building was constructed by the Universalists here on Kenoza Avenue in 1894. Here’s a more detailed history, tracing our roots on both the Congregation/Unitarian and the Universalist branches. In 1639 a letter was sent to colonial Governor Winthrop asking that a settlement be started on the Merrimack River so that Rev. John Ward could be its minister. Twelve men built the original buildings. Originally called Pentucket, the settlement’s name was later changed to Haverhill in honor of the birthplace of their first minister, Rev. John Ward. In 1645 the churches of both Andover and Haverhill were finally gathered. North Parish of North Andover is the descendant of the original Andover Church. The first meeting house of the First Parish was built in what is now Pentucket Cemetery (near Linwood Cemetery, across from First Landing Park). Worship had previously been held in homes or, in nice weather, under a large oak tree. There’s a tree on the grounds of the Haverhill Historical Society known as the Worshiping Oak. In 1697, the second meetinghouse was built, downhill from the site of the former Armenian Church. As Haverhill grew, other churches were established—the North Parish, West Parish and East Parish. The original church of Haverhill became known as First Parish. Theological differences between the Trinitarians and the Unitarians began in 1734 when the Rev. Barnard, minister of the First Parish, began preaching from an increasingly Unitarian perspective. This was the first time a theology other than orthodox Christianity was preached in Haverhill. One hundred years later, after some years of conflict over what theology the minister should preach, the Universalists and Orthodox Congregationalists left First Parish to the Unitarians. In 1849, two years after the fourth Unitarian meeting house burned to the ground, the fifth meetinghouse was built. This was designed by Haverhill architect Alpheus Carey Morse and is one of the earliest examples of Romanesque architecture in the U.S. In 1928, the Unitarian meetinghouse was sold due to dwindling membership. The building was then occupied by an Episcopal congregation, and later by the Armenian Church, until it was sold in 2016. In 1825, the first meetinghouse of the First Universalist Society was dedicated on Summer Street. In 1883 the ministry of the Rev. Dr. Joseph Crocker Snow began at the Universalist church. Ten years later, on January 16, 1894, the congregation dedicated its second meetinghouse on Kenoza Avenue at Monument Square, and we’ve been gathering in this building ever since. The handsome brick building is a variation of the old English village church style. The stained glass windows in honor of Rev. Joseph Crocker Snow were made by Tiffany and installed in the chancel. They were dedicated on January 10, 1904. The stained glass windows honoring the Stover family (on the east side of the sanctuary) were installed in 1922. Six year later, the Unitarian meetinghouse was sold due to dwindling attendance and membership. The Unitarian society, however, remained intact. In 1950, after years of intermittent discussion, the First Parish (Unitarian) and the First Universalist Church joined together as the Universalist Unitarian Church of Haverhill. Eleven years later, at the national level, the two denominations merged to form the Unitarian Universalist Association. For a broader history of Unitarianism and Universalism, visit the UU history pages on the Unitarian Universalist Association website.